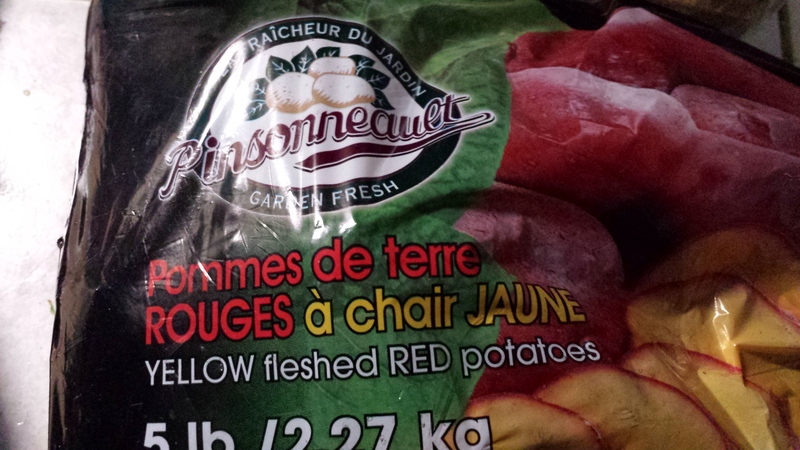 The other day while I was at IGA I came across something I had never seen before: yellow-fleshed, red-skinned potatoes. The brand name is Pisonneault, and they are grown here in Quebec- in Saint-Michel to be exact. Though sadly not organic, the potatoes are very local, and are produced by a family farm. Additionally, they make excellent oven fries! I have never had such delicious, crispy oven fries. 1) Procure your potatoes: remember, not all potatoes are created equally, and some varieties will make better oven fries than others due to starch content, etc. 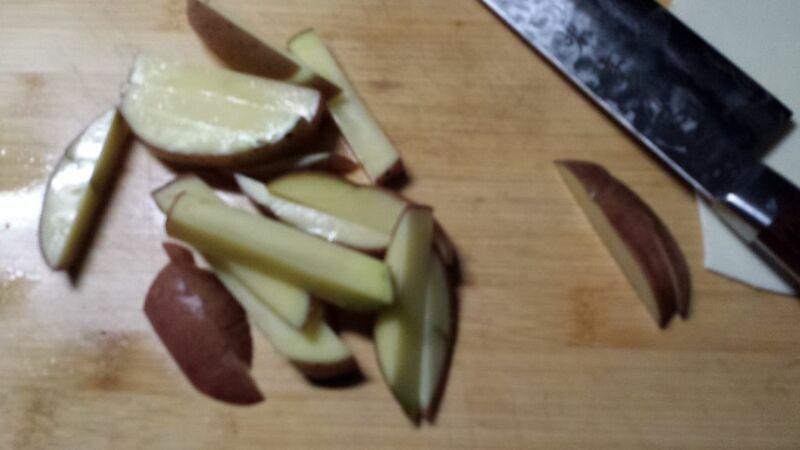 2) Was h potatoes, remove any eyes, then cut them up. I rarely peel my potatoes unless I’m making mashed potatoes or somesuch; there are a lot of nutrients in the skin, not to mention a lot of flavour. It’s also less work! 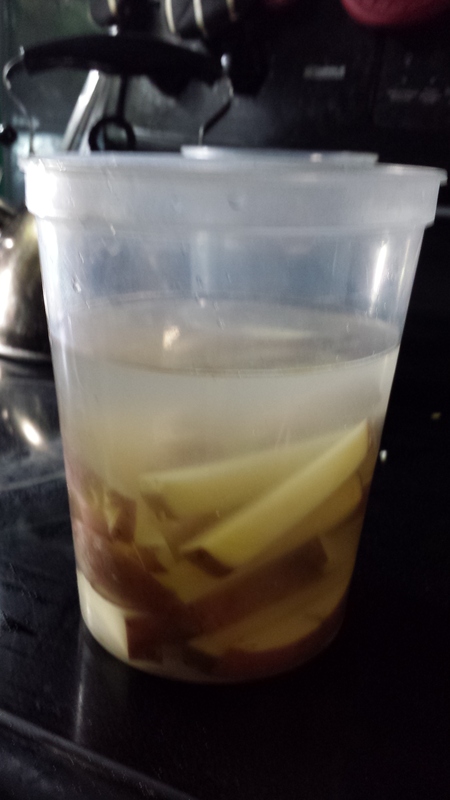 3) Soak your fries in water: Even if you only do it during the time it takes your oven to preheat, don’t skip this step. It will help make them extra crispy. You can even leave them soaking in the fridge overnight, so that they’re ready to go the next day! 4) Preheat oven to 425 F, and season your fries. You want a fairly hot oven for oven fries. Once your oven is heating, it’s time to strain the fries, removing as much water as possible. You can even dry them off with a towel, if you like. I like to season them right on the baking sheet, but you can use a bowl if you want to be all proper. You’re going to need oil, enough to coat all your fries well- I always use olive oil. And you’re going to need salt. You can also add pepper, paprika, smoked paprika, curry, oregano, cayenne- whatever spices you like. 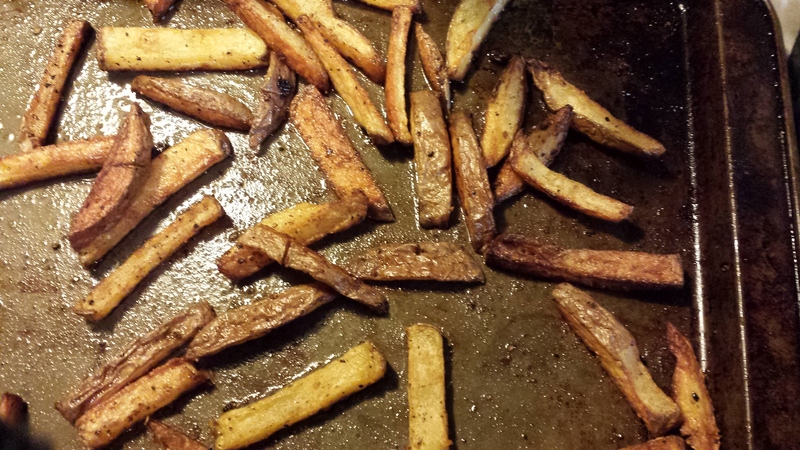 Toss your fries to make sure the spices are evenly dispersed. 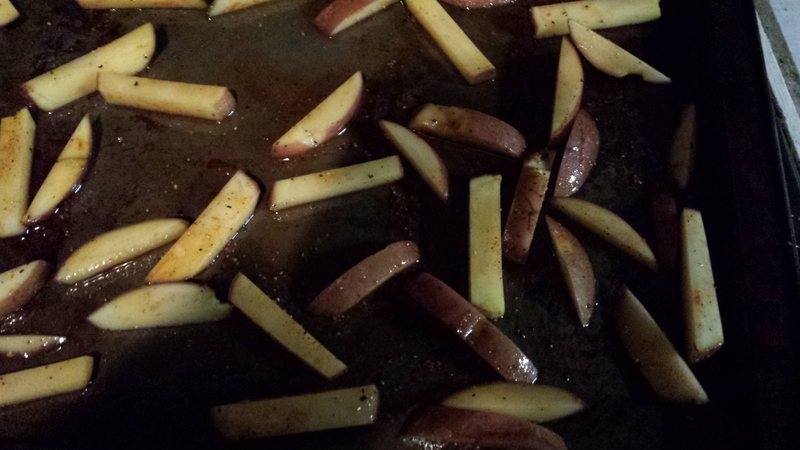 5) If your fries are not already on a baking sheet, put them on one. However, make sure that your baking sheet is large enough to ensure the fries are not crowded. If you don’t have a large enough baking sheet, use two…or three. This is important if you want crispy fries. 6) Once your oven is hot enough, it’s time to get that (or those) baking sheet(s) in there. About every 6 minutes or so, use a spatula to move the fries around so that the same side is not always facing the baking sheet. After about twenty minutes, they should be done. 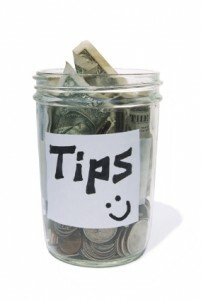 Did you find this post helpful or entertaining? Feel free to throw me a buck or two! Mostly cloudy skies with rain... which world are you living in, weather report?